Two Good Scents Peaches & Cream + Watermelon Taffy Scrub Reviews + INTERNATIONAL GIVEAWAY! Recently I had the opportunity to pick out two scrubs from Two Good Scents & today I’m sharing them with you along with my thoughts! The scents I couldn’t help but choose were Peaches and Cream & Watermelon Taffy. Clearly I’m hanging tight to summertime right? I think you will all be pretty impressed with the results…which is awesome since you’ll be able to win one of your own!!! From Two Good Scents: Two Good Scents was founded by myself Paula Goodman and my sister Nancy. Hence the name “Two Good Scents”. I have always loved bath products, scrubs, gels, soaps, you name it and I would try it. We all have our favorite scents that make us happy. 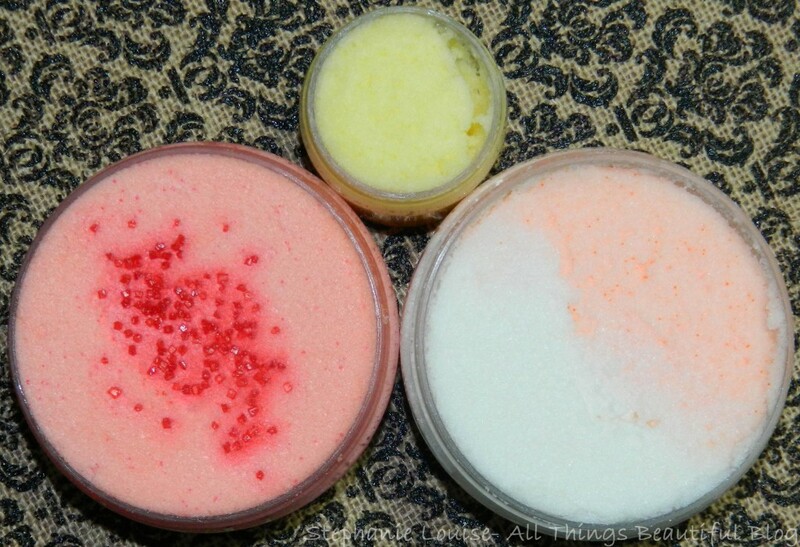 I thought wouldn’t it be great to have the wonderful scents I loved in a sugar scrub? So I got to work and that is how it all began. The best part of the journey is getting the feedback from customers and how they love the scrubs. We offer all different kind of scrubs, bakery, floral, and clean. Our scrubs will change with the seasons but we will always offer our top sellers. I found overall these scrubs were very consistent in texture & formulation. The sugar granules are very fine & not scratchy at all! In fact, they’re packed with butters which are super moisturizing. So after you scrub your body down you’re left with soft, smooth skin. Lovely! These aren’t oily like other scrubs either- it holds together really beautifully! 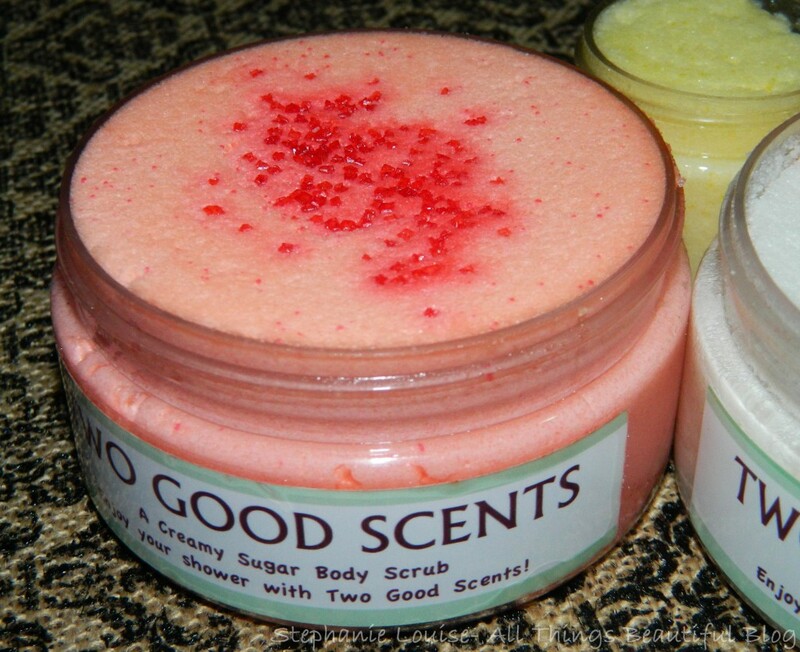 Two Good Scents Creamy Sugar Body Scrub in Watermelon Taffy– This was my first pick because I’m a watermelon fanatic! Sweet watermelon swirled together with vanilla taffy according to the site! This particular scrub has added shea butter & really does smell like watermelon taffy! Neither of my parents ate taffy but I got it when on road trips just for me so it smells like summertime to me! 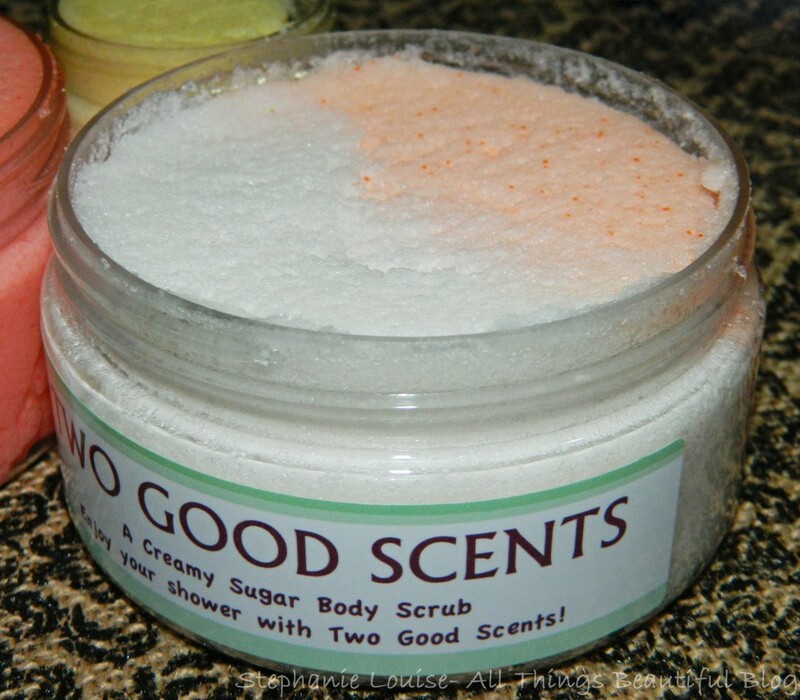 Two Good Scents Creamy Sugar Body Scrub in Peaches & Cream– The site describes this as a juicy Georgia peach with fluffy white marshmallow cream – side by side & I have to agree! The peach side doesn’t make me think it is artificial which is really nice- it isn’t too strong or too sugary smelling. The cream side smells like fresh marshmallows which I’ve actually made myself so I know what I’m talking about! This scrub also contains additional mango butter. 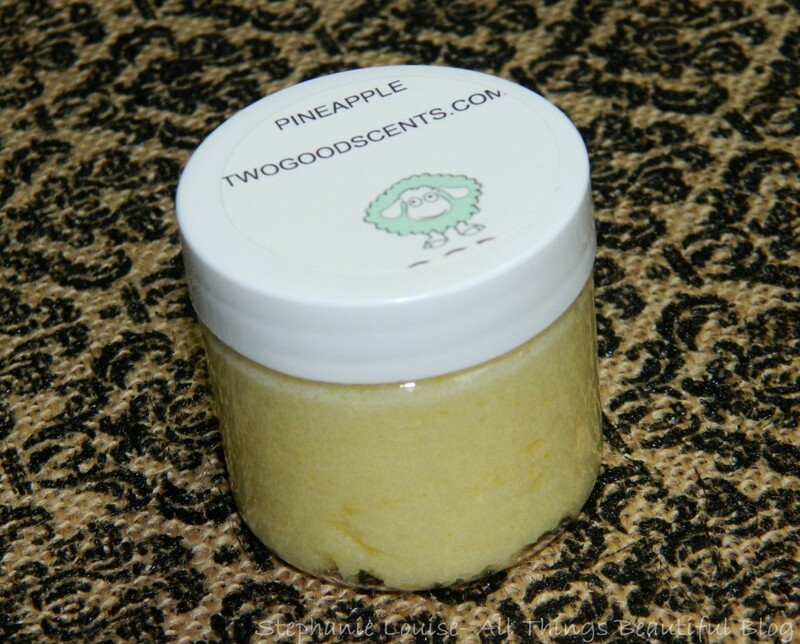 Two Good Scents Creamy Sugar Body Scrub in Sweet Pineapple– This was an excellent addition to the two scrubs I chose- I’m crazy for pineapples! This also contains mango butter & the scent itself smells like an iced pineapple drink! Two Good Scents describes it as Sweet juicy fresh pineapple! Sitting on the beach with a tropical drink! which I totally agree with! Two Good Scents has been kind enough to offer my readers not one, not two, but THREE chances to win a scrub of their choice! This giveaway is open INTERNATIONALLY & you can enter using the rafflecopter widget below!